I have been working on Haye House, a private house directly across the road from the old Breedon Bar pub. Please could you supply any info of this lovely house? The plaque on the exterior of the building reads Haye House 1862. We have a relation, Brian Lambert, over from Australia. Could someone help please if anyone has any memories or photos of a company called R J Hunt, a foundry which was situated by the bridge close to the Breedon Cross pub. Any help would be gratefully received, thank you. Any information please leave a comment below or email us and we’ll pass it on. I live on Pershore Rd, just over the Breedon bridge towards Stirchley. I have read alot of stories of Cotteridge and Stirchley up and down the Pershore Rd but never ever find any stories or pics about these houses (1616-1630) or the old factory site next to these houses by the canal. If ever you find any it would be great to read them. If you have any information, email us using the link above; or leave a comment below. – Any hotels in the area in the early 20th century. Stirchley has its own forum, featuring lots of questions and discussions about its past, present and future. See here for the site. As you may already know this road runs parallel to Pershore Road and was mine, and loads of other young lads, rabbit run to Stirchley Senior Boys School, via Elm Tree & Ash Tree Road. I recall that at the far end, from Cotteridge, was Ten Acres & Stirchley Co-op bakery, & their Works & Building Dept. By referring to the Stirchley Website I was able to confirm my own memories, that it suffered some bomb damage, and casualties by the name of Bishton(?). 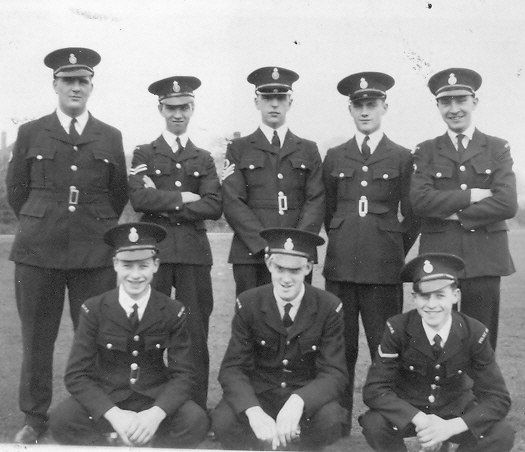 During the 1939/45 war it was also my route, when reporting for duty at Stirchley Police Station in Victoria Road. Maybe because I associate this road with school and war duty I do not have any affection for it. Police Aux M. S. This was the name displayed on the shoulder flash. We were trained by senior police officers and I now understand how they relied and trusted us with responsibilities and authority, far beyond our youthful looks. Anecdotes would fill a whole web page, some sad and serious, others a real howler. I can recall some of the names of the Police Messengers, based at Kings Norton and Stirchley Police Stations. Back Row L to R: Lol Avery (well known neighbour to your contributor Doreen Hill), Cliff, Stan ___, Bob Sanford. Front row, Roy Mosely, Stan Boraston, Ray Mosely (yes they were twins). Stan Boraston achieved acclaim for organizing a dance (with gramophone records) at Selly Oak Institute where most of the “B” Division, including Senior Officers, attended. There was even a picture in the Birminham Mail.